Bettys Cookery School in Harrogate is in a large, purpose built structure on the same site as the bakery supplying Bettys Cafe Tea Rooms and just down the road from the warehouses of Taylors of Harrogate, where the family business blends its tea and coffee. This means that you arrive into a delicious smelling world of coffee and cake. I was attending the Teatime Treats course, a full day from 8.45am to 4.45pm, taught by Lisa Bennison and Michael Vanheste. On arrival each of us was provided with a locker and an apron, and ushered into the spacious kitchen where a breakfast of fresh fruit salad and croissants was supplied, along with tea and coffee. Lisa explains that the aim of the day is to make everything by ourselves for ourselves, with plenty of supervision to make sure we don’t go wrong. The day follows a format of demonstration then practical, while Lisa and Michael walk around making sure we are confident and comfortable, lending a hand here and explaining a process there. The demonstrations are all clear, with lots of detail and helpful tips, hints and recipe alternatives. There is an impressive attention to recycling and composting and we are encouraged to take home our little plastic ingredient pots, leftover egg whites and spare strawberries. I’m working next to another Helen who has been to Bettys several times before. When I ask her what draws her back she says that it’s a combination of the high standards, great tutors and the way the school looks after you. By the end of the day I can see what she means. We start with pate sucrée (or sweet pastry) which Michael shows us how to work for the base of our strawberry tart. The key, he tells us, is to avoid overworking the pastry, avoid making it too wet (shrinkage!) and to allow it to rest in the fridge. With our pastry resting we move on to crème patissière. I’ve never tried making this before, despite being an avid baker, but under expert supervision I felt confident about getting it right, and rather pleased with myself when it worked. Again we had lots of tips – hang on to the vanilla pod afterwards, dry it and use it to make vanilla sugar – and alternatives – try adding cocoa, for example or hazelnuts. After a nifty tip on how to make a greaseproof paper circle, both Lisa and Michael strongly recommended buying an oven thermometer, in order to be able to get the accuracy required for good baking. Popping our pastry to bake we had elevenses, then made Parmesan and chive scones. Lisa told us the beauty of scones is that they take only ten minutes to make, ten minutes to bake, and the key is to work fast once you’ve added the liquid to the dry ingredients. In the oven these smell so delicious – exactly the sort of the thing you should bake to sell your house fast. Yukako, who is baking opposite me, is particularly enjoying this part. She’s in the UK to learn skills she will take to her own cookery classes in Japan and has also taken several courses at Bettys. I had a large coffee to wake me up after my generous lunchtime glass of wine, then we’re on to courgette, walnut and pistachio loaf, apple crumble muffins and vodka and orange cake. Further tips here included always using a metal spoon to fold in cake ingredients; wipe courgettes don’t wash or they’ll absorb more water; use earthenware dishes for mixing but metal ones for eggs and for cream. The day closed with us adding the finishing touches to our strawberry tarts. This is when Michael shared with us my favourite tip of the day. The way to get a professional finish for your pastry case is simply to go around the baked and cooled edges with a peeler, shaving off raised areas. Simple but effective. We had been provided with plenty of name stickers and ample packaging to transport our bag full of goodies (you also keep your smart white Bettys apron). There were a range of abilities between those of us on the course, but everyone clearly left feeling very satisfied with what they’d learned, made and eaten. The courses are at the higher end of the day-course budget, but still represent great value for money. As for me, I’m probably going to spend the summer eating crème pattisière with a spoon. 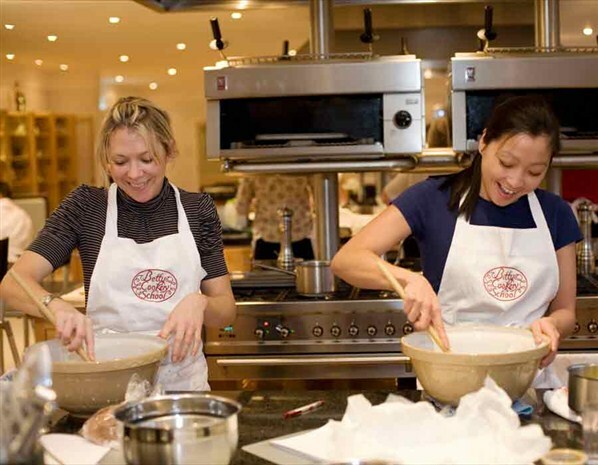 Bettys Cookery School offers an amazing array of cookery courses for bakers of all levels. Day courses typically cost about £175.